If you are an outdoor enthusiast, you know very well that sometimes your phone just can’t catch any signal. This is where walkie-talkies come to a rescue with their use of radio frequency to communicate on a shared frequency band. They are also fun to use and can help with group activities. If you haven’t used walkie talkies before – you don’t know how much fun you are missing! Come on, admit it — wouldn’t using call signs and the over-and-out routine be cool? You probably pretended doing so as a child. Now, you can have the real deal. Communicating using a walkie-talkie has several advantages over doing so with a mobile phone. First, the batteries on walkie-talkies last much longer than cell phone batteries. Second, using a walkie-talkie with the Family Radio Service (FRS) is free. But with mobile phones, you have a tall bill to worry about. Next, walkie-talkies are robust and durable. Even if you drop them, it’s not going to wreck the equipment. However, you have to be much more careful while using a cell phone. Another perk to using walkie-talkies is simultaneous communication with many people. You can have your entire party on a single channel, and you all can talk to each other as you would in a conference call. Also, you don’t have to worry about signal strength or reception quality. 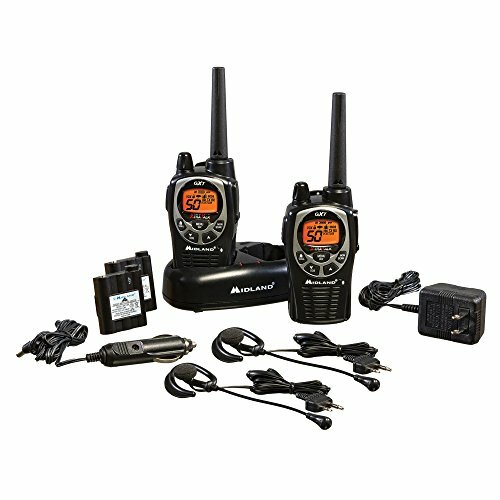 The Midland GXT1000VP4 36-Mile 50-Channel FRS/GMRS Two-Way Radio gives you an impressive 36-mile range. This is quite a feat, especially if compared to other walkie talkies in its class. You will also have peace of mind knowing that you are buying a product that is made by an international industry leader in wireless communications. Midland did a great job manufacturing this walkie-talkie and this is our top pick. 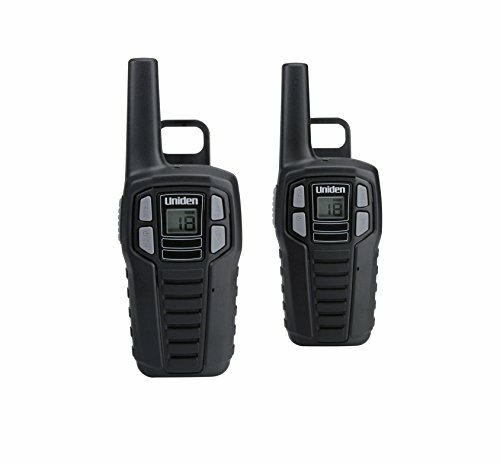 It’s hard to match the features this walkie talkie comes with at this price point. It only comes down to ~$35 per device. An absolute steal of a deal. 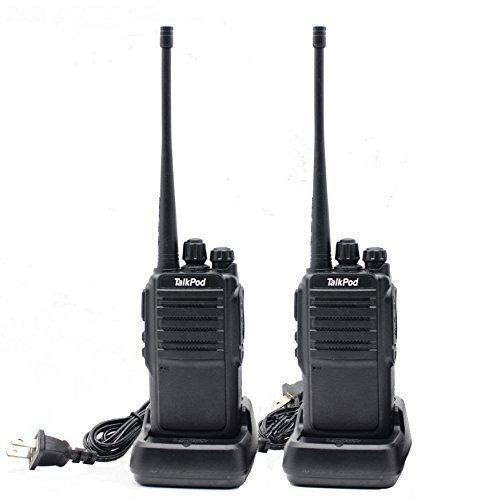 It is one of the most popular walkie talkies on Amazon and boasts over 2000 5-star reviews. The Baofeng BF 888S is one of the greatest long range Walkie Talkies on the market. It gives you the convenience of communicating with each other in a range of about 4 miles. While this product comes cheap at around $12 per piece, don’t let the price fool you. 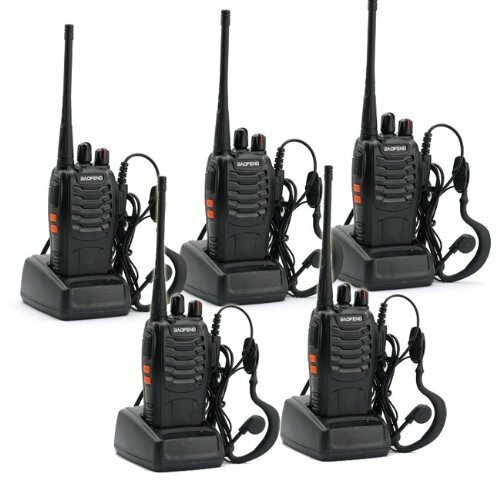 These are great walkie talkies, and they provide great value to price. Operating on a frequency of 400-469.995MHz. Enjoying the convenience of charging on a 1500mAh Li-on Battery with a low voltage alert function. Having an equipped VOX Function, voice prompt, PC programming, and 3 watt transmit. An emergency alarm, a time-out timer, and a flashlight. The Motorola MH230R 23-Mile Range 22-Channel FRS/GMRS Two-Way Radio will show you why Motorola is the trusted name when it comes to walkie talkie manufacturing. This radio works very well, even in mountainous areas where the need to communicate with others is crucial. This walkie talkie features a 10-hour alkaline or 8-hour rechargeable battery life. It is also equipped with 11 weather channels with alert features. Your privacy is guaranteed with 22 channels, each with 121 privacy codes for that much-needed interference protection. The package includes 2 radios, 2 belt clips, 1 dual drop-in charger, 1 Charging adapter, and 2 NiMH rechargeable battery packs. The battery life for this radio is quite impressive. The one thing that makes this radio a leader in its class is its ability to transmit across mountains. If you are on one side of a mountain, you can still speak to your companions easily. 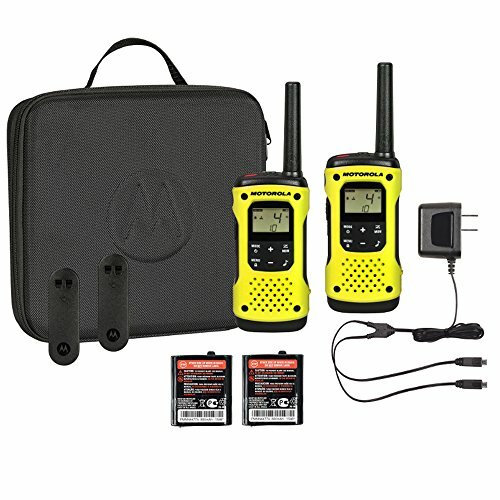 This two-way radio lives up to the Motorola quality by offering a great range, and an impressive battery life. Imagine being on site for a job. Or camping in hilly terrain. Both places where communication can be difficult. That’s why reliability matters when it comes to walkie-talkies. So, if you need a pair that reach both far and high, then check these out. This set has a range of 300,000 sq. feet and reach as high 25floors: great for if you’re a first responder or working in a tall building. 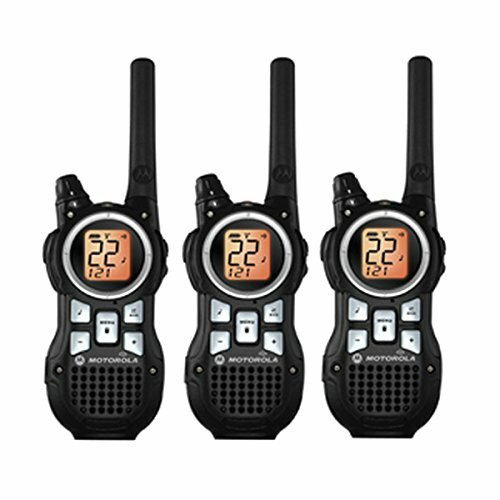 water resistant features, combined with signal range and swivel holster, make these a durable walkie-talkie. Plus, with their long distance reach, they make a good alternative to cell phones. These might be a bit pricier than other walkie-talkies on the market, but the features are excellent and current reviews are very good. What’s’ more: the Dewalt brand is known for its reliability, quality, and durability. Another pick by Midland is the X-TALKER. This pair has a range of 32 miles: great range and clarity. And with their camo covering, hunters won’t have to worry about this piece of equipment being noticed. Nor will it scare off their prey. Unlike other sets on the market, these have a tone coded squelch system to block conversations. Now you can keep a low sound profile in your blind while waiting for the ducks or deer to come in. For $79, this set s a great option for the hunter you know. These also come with a hands free option, perfect if you need to talk to your hunting crew while getting your blind set up. You won’t have to worry about managing communication while also keeping a handle on your gear. If you’re the type of outdoorsman or hunter that grew up operating CBs, then these might be for you. These are a newer model from Cobra. With over 2,000 channel combinations, these offer more channel options than you can ever dream of using. Like other models, these come with a NOAA station detector. But with a built in LED flashlight (and rubberized grips) these stand out. An average of 3.6 stars from over 400 reviews on Amazon makes these a solid choice. They can also be useful when you are traveling with several people and need to split into two groups. And, their rugged and bright orange design makes them easy to find. 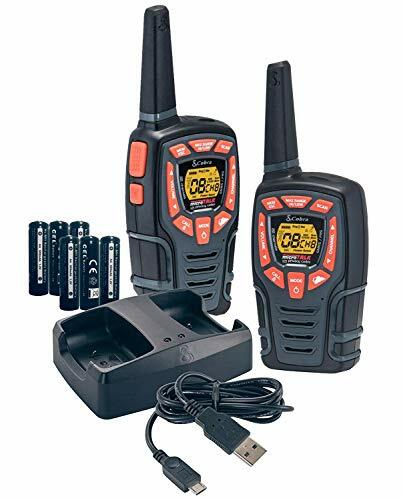 If you’re looking for a quick and easy but reliable source of communication besides a smartphone, we recommend this set. One of the great things about this radio is that it’s waterproof. This feature protects the walkie talkie not only from dust but also from harsh weather conditions. Like the other walkie talkies, this one uses NOAA channels to provide emergency alerts when dangerous conditions arise. It is also equipped with a mini-USB charger for portable convenience. This is great for charging at home, or taking along to recharge in a hotel or campsite. These features provide the complete emergency preparedness communication solution. You will always have peace of mind during those evening adventures or unexpected emergencies and power outages. Manufacturers of this radio are willing to offer a phenomenal guarantee because they stand behind their products 100%. Simply follow the directions when you receive your Talkpod two-way radio for you to be eligible for the guarantee. The guarantee is simple: if you find anything wrong with the radio within 30 days, it will be replaced, no questions asked. Apart from having a durable design, this product comes with an impressive after sale service. The radio is easy to use, and is easy to carry because it’s so light and small. In addition, it is very comfortable when held in your hands. It has an 1800mAh for the battery, meaning that it will last longer and charge faster. This set from Uniden is a great choice for those with a practical need. For example if you’re camping, or on a cruise, and don’t have a need for significant distance, these are an excellent option. Great for parents and kids, families, or emergency bags. While these may be great for everyday needs, emergency personnel may want to consider something more durable. These do come with one unique feature: a push to ring feature you can activate if you lose one. At $29, this two pack brings a lot of value at an affordable price. With over 1,000 reviews and an average of 3.6 out of 5 stars on Amazon, this set makes an excellent choice for those with a utility need. Their compact size makes them great for kids or families. 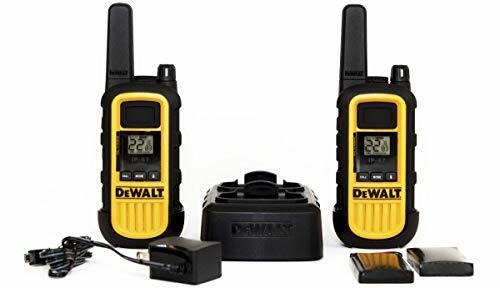 Before you buy a walkie-talkie, there are a few g First, you need to set an upper limit to the range. Second, make a list of your group members so that you can order the right number of units. Next, compare brands based on the range, features, accessories, and price per unit. Remember; go through the features one by one. If you don’t know what a feature is, and you’re not interested in learning about it, don’t bother paying for it. After all, features are for cell phones; walkie-talkies are supposed to be plain and simple. 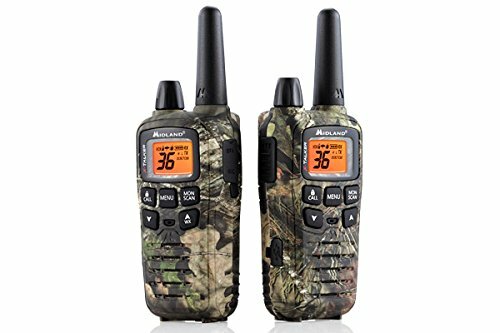 In summary, if you’re looking for the best value for money, you should go for the BaoFeng BF-888S because you get five sets for about $75. That works out to just $15 a piece. But, if you have a small party, you may not need these many sets. In that case, the TalkPod Walkie Talkies are your best bet. And if you need walkie-talkies with more than a 20-mile range, consider buying the Motorola MH230R, the Motorola MT350R, or the Midland GXT1000VP4. However, these models are relatively more expensive. Since its invention in the late-1930s, walkie-talkies have become more sophisticated and portable. The core principle, however, remains the same. That is why using a walkie-talkie has a rustic charm to it. Communicating via cell phones is the mainstream method of keeping in touch in the digital world. But, a lot of people go camping to break free from the grid. 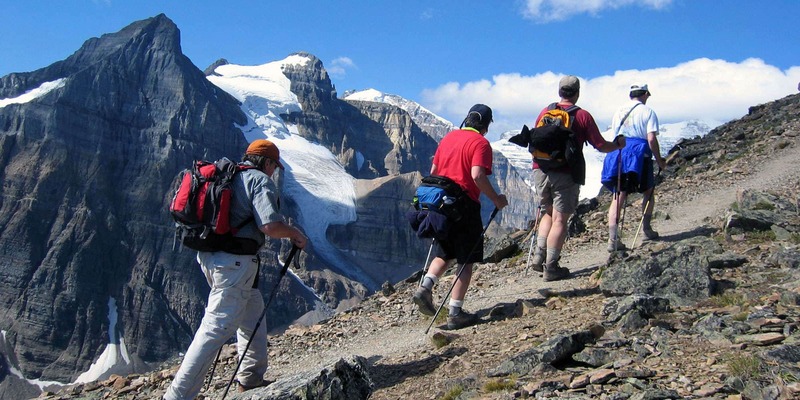 So, replacing cell phones with walkie-talkies gels perfectly with the outdoor lifestyle. You will still need a cell phone; but you can give it some well-deserved rest. Let the walkie-talkies do the talking. The amount of fun you can have with a walkie-talkie is limited only by your imagination. So, how far can you push the fun-velop?